Boil the noodles as per the instructions on the packet. See that it is not overcooked as it will be again cooked in white sauce. Drain the water and keep it aside. Take a pan and heat butter. Add maida and sauté it till it turns light brown. Add milk and stir it continuously to avoid lumps. Boil it till it thickens. 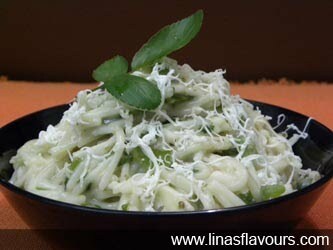 Add noodles, basil leaves, ginger-garlic paste, capsicum, half cheese, salt and cook it for 4-5 minutes. If it is too thick then add some water. Garnish it with remaining cheese and serve it immediately.